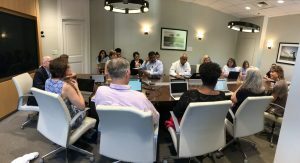 Chancellor Felt met with faculty to discuss the future of Silent Sam (Jared Weber/Carolina Connection). UNC prepared for yet another demonstration on McCorkle Place Saturday. That’s been the site of several protests since Silent Sam, the Confederate statue, was toppled by a group of demonstrators August 20. Previous protests have been marked by confrontations and arrests. University officials are asking students and other members of the campus community stay away from the possible protest. Meanwhile, the Silent Sam statue remains missing from its pedestal on McCorkle Place. UNC officials say it’s in storage, but they won’t say where. Chancellor Carol Folt says a process is underway to decide whether the statue will be put back up. Folt also says she’s seeking “lots of listening on campus and beyond” as the University works through the issue. She started local, meeting with a Faculty Council subcommittee on Thursday morning. Jared Weber was there.